The first time I heard of Lumiere London, I thought it was some kind of Beauty & the Beast themed event all across London – remember the singing French candlestick? However, the event is not Disney related, but it is equally as magical! Lumiere London is an arts & light festival transforming locations all around central London when darkness falls, from the West End to Kings Cross and several places in between, running for 4 days from Thursday (14th Jan) to Sunday (17th Jan). There are 31 different installations by a whole host of artists for you to wander around, admire and peruse at your leisure. Arriving at Leicester Square at 6pm on the same day as Leonard Di Caprio & Tom Hardy (for the Revenant UK premier) was not the best idea, because the whole world and his dog had also decided to go to Leicester Square in the hopes they would rub shoulders with some celebs. However, after taking an unreasonable amount of time getting from one side of the square to the other, I found my friends and we decided not to stick around, and to instead make our way to the first stop: Piccadilly Circus for Les Luminéoles, by Porté par le vent – a trio of beautiful glowing fish that change colour as they swim elegantly through the air above Piccadilly. Further down the road you can see flashes of colour projected on the side of a building. The wonderful projections by NOVAK change colour, and shape in perfect time with some pretty epic music – displaying faces I recognised, like Olivia Colman – who plays Sophie Chapman in Peep Show (pictured below) and the very handsome Idris Elba, as well splashes of colourful paint all over the place. I found myself stood staring, watching this beautiful coloured wall for a few minutes in complete awe! As we continued walking and admiring the colourful wall there were loads of helpful people in bright pink tabards happy to answer queries & giving out maps! The map was very handy seeing as the maps I had were on my phone, but my fingers were so cold by this point I had to wear my gloves and had resorted to unlocking my iPhone with my nose (not practical and very time consuming)! Top’la Design /Catherine Garret’s Elephantastic was an interesting site – it looked as though a Giant African Elephant was stood watching over the people walking by on Regent Street (although funnily enough our first view of this installation was of the rather large behind), and stomping his feet and trumpeting at them. Not quite as creative as some of the others I saw this evening, but pretty cool never the less. 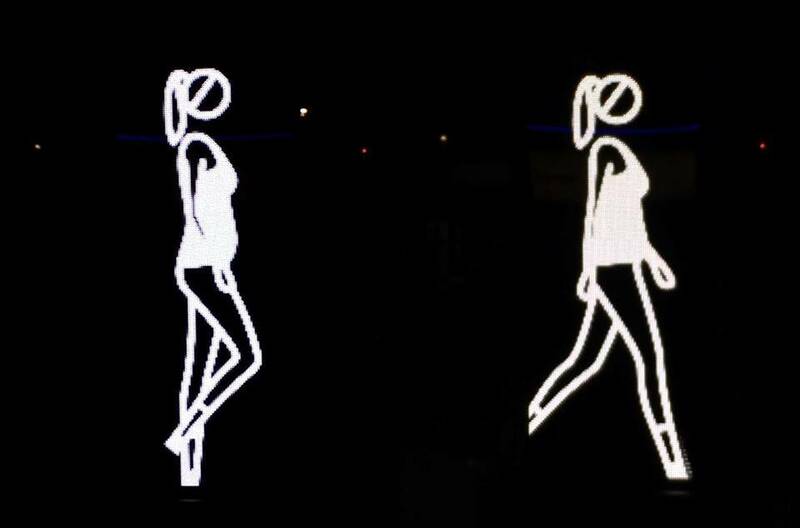 As well as a couple of smaller installations such as: Shaida Walking by Julian Opie – who is best known for his cartoon like celebrity portraits which includes the art work for the Blur: Best Of Album, and one part of Tae gon KIM‘s Dresses (you can find the rest of the dresses in the Kings Cross area). 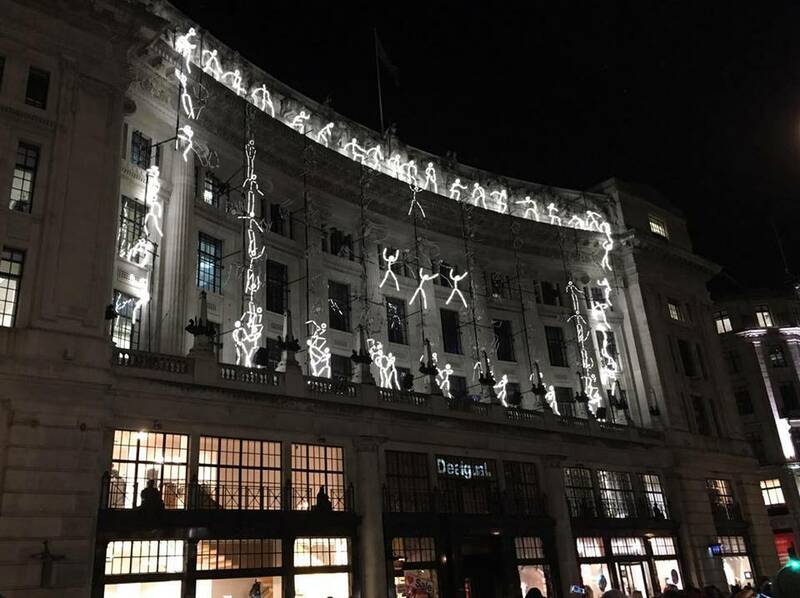 There were some rather fascinating, glowing stick men (called Keyframe) jumping around the side of buildings on Regent Street. The installation by Groupe LAPS / Thomas Veyssière was accompanied by computer game sounds as the stick men climbed, tumbled and jumped across the walls. This next one 1.8London is a beautiful, pulsing net sculpture, that’s stretched high above Oxford Circus, across 4 points, which as I walked up Regent Street reminded me a little of the Northern Lights pictures I’ve seen! 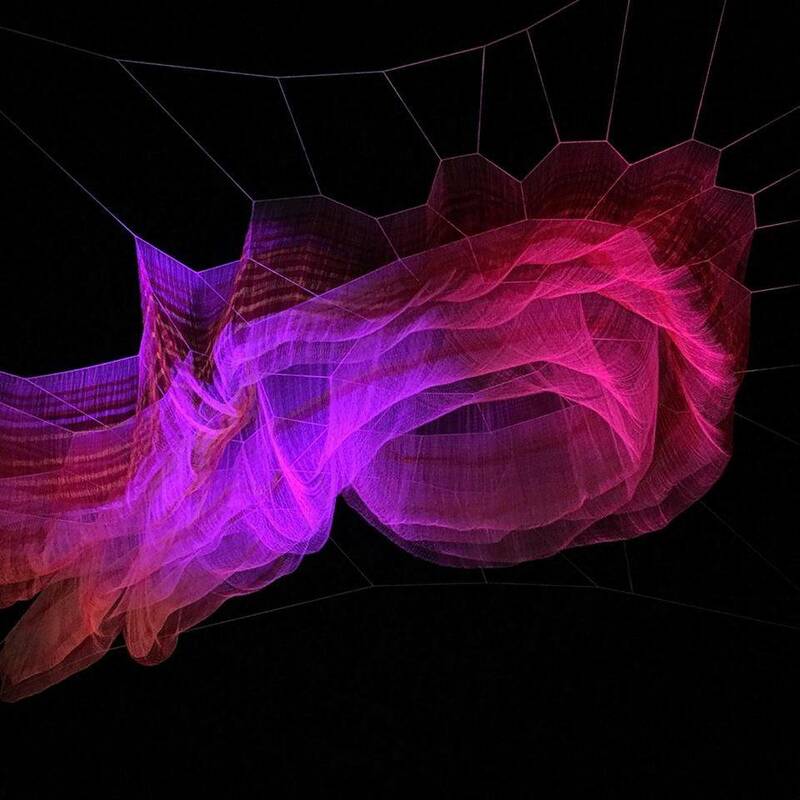 Created by an artist who is known for her work inspired by natural forces (the inspiration behind this being the 2011 Japanese Tsunami), Janet Echelman so named it this because the 2011 Tsunami was so powerful is temporarily cut 1.8 micro-seconds off the length of the day. Okay now we’ve got to my ultimate favourite installation (for purely aesthetic reasons). 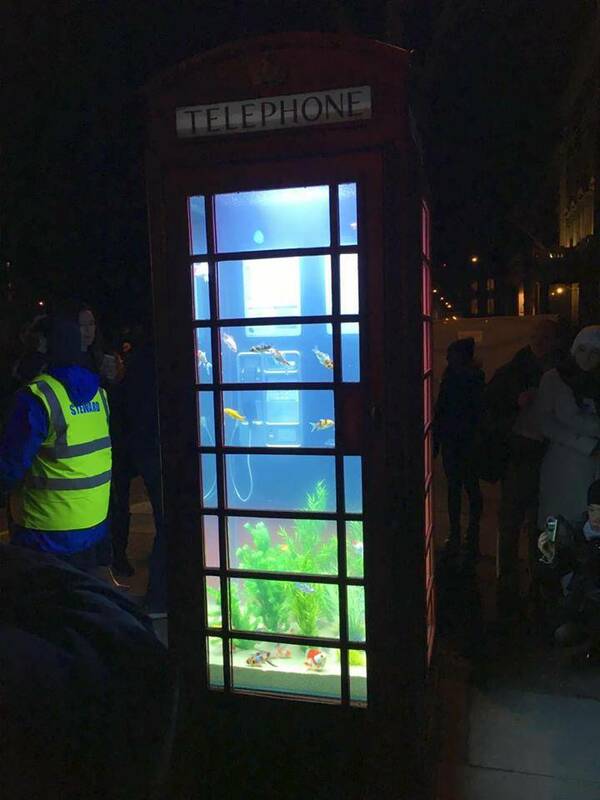 A London phone box filled with water and GOLDFISH!! 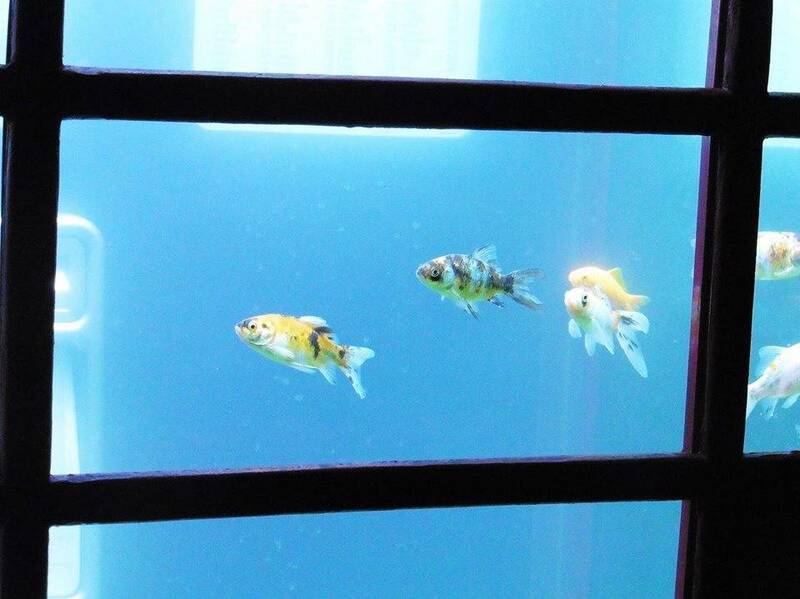 Yup, real goldfish. All of them just swimming around, minding their own business, chilling out on the bottom of the tank with their friends, making calls, you know, usual goldfish stuff… The crowd surrounding this was pretty intense – with everyone vying for the best spot to take a photo, but regardless of all the other humans trying to get in the way of my perfect instagram photo (c’mon we were all thinking that right?) it was iridescent and wonderful. My only slight concern about this one, as a fellow creature of the earth, is whether the gold fish are kept happy, looked after, fed well and not in an over crowded environment… But I would think as this is so very clearly on display in the middle of Mayfair (one of London’s fanciest areas), that the fish would be looked after well. 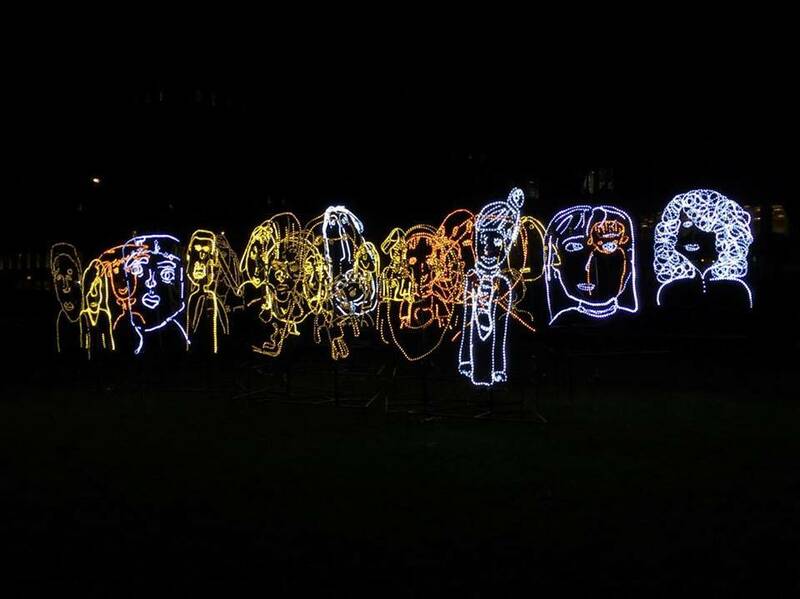 Also within Grosvenor Square area was Brothers and Sisters, by Ron Haselden featuring a number of cartoon-like faces and silhouettes made out of lights. Spinning Night in Living Colour (video below) by Elaine Buckholtz was mesmerising. The subtle light changes and hypnotising music was incredibly magical. The final pieces I saw before heading to Bond Street station to travel home, were some very unassuming and peaceful features. Some coloured light up “bird boxes” called Sanctuary, complete with beautiful tweeting bird noises (which was very bizarre to hear in the evening in the middle of London), and Dissect, both by Sarah Blood. I’m a little disappointed I wasn’t able to make it to Trafalgar Square/Westminster area or Kings Cross, but am over the moon I managed to see as much as I did! I can’t imagine it was easy closing roads and bringing some of the main transport links to central shopping areas to halt for 4 whole afternoons, but I’m really glad they did! Where? All over London! Check out the Map here. Travel information/bus routes affected: click here. When? Lumiere runs from Thursday 14th – Sunday 17th January. Starting at 6.30pm, and finishing around 10.30pm each night! How much? It’s totally FREE – YAY! Despite the crowds, the very cold temperature and the excessive light pollution of London (coming from shop windows that are on 24/7!! ), I had an absolutely lovely evening. If you’re in London this weekend and have a couple of hours to kill, wrap up warm, grab yourself a coffee and fall in love with London at night – and not for the “nightlife” but for some ‘arty farty’ cool stuff made by a bunch of talented artists. 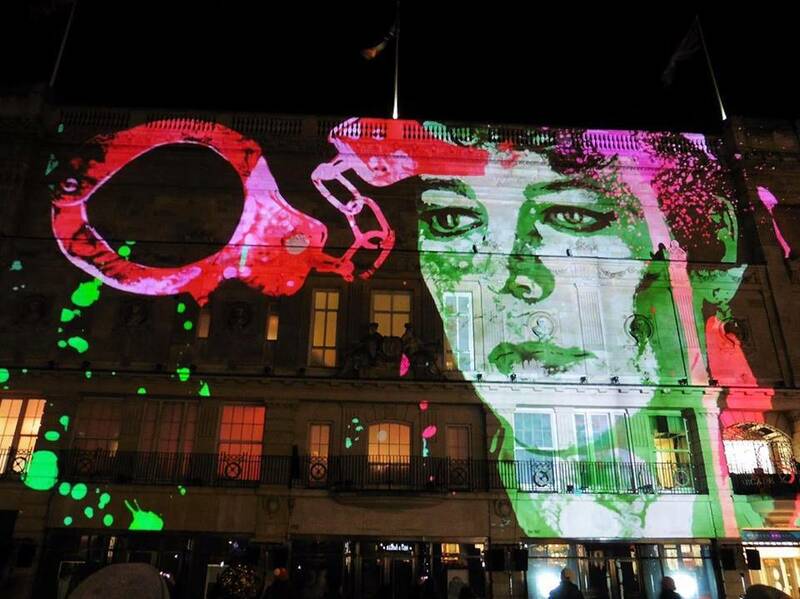 Did you go to the first night of Lumiere London or are you planning to go this weekend? 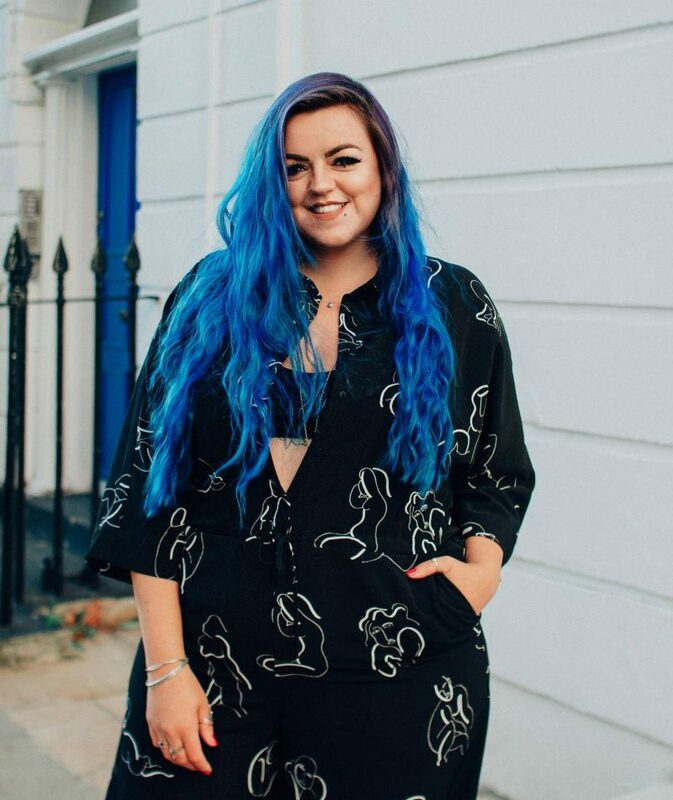 Let me know what you think in the comments, and feel free to share any blog/picture links from the festival! This looks awesome! I’m going on Sunday, excited!! Wow it’s so beautiful and creative. I so so wish I could see this colourful London night. Sadly I’m time trapped on the south coast ! I tried to have a look around yesterday but it was so busy! 🙁 Your pictures are awesome, wish I’d visited with you guys!